Georgia State cyclists are hoppin’ curbs and cruisin’ sidewalks. But [for the most part] they’re not doing this to piss off pedestrians. They just need more bike lanes. Georgia State senior Jeff McKeon approached The Signal in June with concerns of his school commute. He said his ride to campus from the Old Fourth Ward is no great burden, but on his way home, he dodges motorists, swinging car doors, and Atlanta’s new 48-ton transit mammoth, the Streetcar. Atlanta today is peppered with cyclist co-ops, repair shops, and advocacy groups such as the Atlanta Bicycle Coalition (ABC) and Panther Bikes. But some initiative leaders worry the existing lanes aren’t connected in the necessitous high-traffic areas. 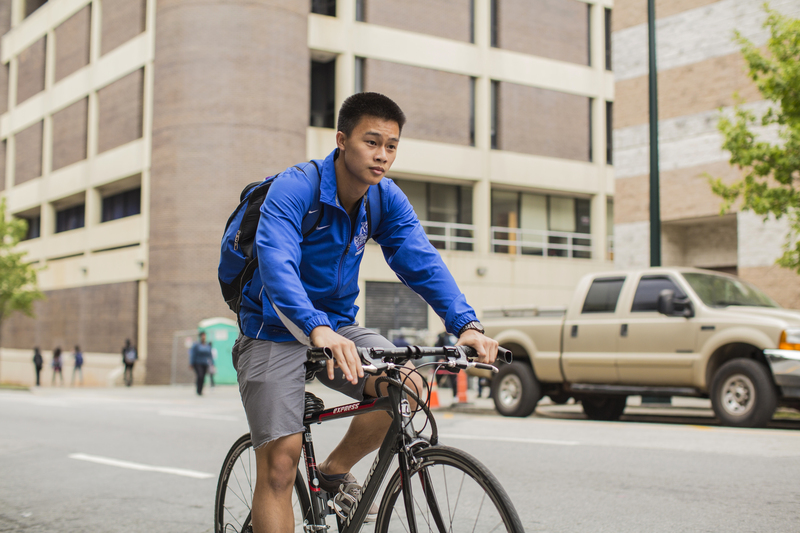 Katie Woei-A-Sack, president of Panther Bikes, a Georgia State organization advocating for active lifestyles and decreased automobile pollution, said the number of riders on campus is increasing, but they’re stuck sharing the same lanes with engine propelled travelers. ABC has lobbied on behalf of the bicycle class to rouse city council attention to their call. But legislation for Downtown lane changes is lingering in its preliminary stages. Atlanta Downtown Neighborhood Association President Kyle Kessler said city hall has yet to adequately address connectivity issues and [possible] restriping proposals which would put in bike paths. He cited Edgewood Avenue’s closure for construction near Woodruff Park as an example of the sense of urgency [or lack thereof]. And Kessler said the nation’s metrics for bicycle use are skewed because, in a typical survey study, questions ask if people use bikes to commute. But he said it can be difficult to discern what constitutes a commute. But Kessler said the Atlanta Bike Coalition was able to allocate funds to create a new ‘bicyclist liaison’ position for the city. McKeon said he thinks plenty of other major metropolises have successfully integrated bike travel with automobile traffic. So why not Atlanta? And several city officials accompanied ABC members in Chicago earlier this month for a study tour of Chicago’s bustling infrastructure, which boasts a more functional, interconnected bike lane network than Atlanta’s. Kessler said the councilmembers and coalition affiliates took the trip to get an empirical vision of how a flowing bike path system operates in another frantic city. However Kessler said it’s curious that bicyclists are having to fight to regain their rightful spot on Atlanta’s roads. So when he heard chatter from a Buckhead CID meeting that Atlanta must choose; bikes or cars, Kessler said the need to pick is outlandish. And today bikes are a parasites latching on to the infrastructure paid for by cars.